In March I started a new job, working for the only SEO agency in the village. As part of my continuous improvement training I was sent down to BrightonSEO to find out what the top SEOs in the country (and beyond) are doing to provide the best possible services to their clients. In short, at BrightonSEO I learned that today SEO is all about marketing and PR. The day was packed with talks at the Brighton Dome although I only left the main hall for lunch – the smaller side talks were oversubscribed and few were as interesting as the main event, which included three main sessions: SERPS, Link Building and Content Marketing. OK, there was an earlier discussion in the morning, but that was not so relevant to my line of work so I skipped it to ensure I was fresh for the most important sessions. Guest blogging has been replaced by marketing and PR (public relations). The best link builders are creating excellent content on client sites and pushing this out to journalists, website owners, bloggers etc. Outreach is still important, but for best results everything needs to be scaled up. SEOs are using tools to gather more leads and manage guest posting outreach. Building solid relationships with influencers (anybody with a lot of reader, followers, fans etc.) remains a top priority. (to avoid post mulitple pages I have dumped everything on one page and this means I have decided to use three or four H1 headers. I know it is not considered best practice, but I am not doing it for Google, I am doing it for readers!). Jon talked about cannibalisation or SERPs – when website owners harm their own rankings through the development of “disconnected ecosystems”. This happens on the main domain, with sub-domains, and alternative country domains. Sites rank very well for their main term but lose rankings unexpectedly and the reason is usually because duplicate content is created elsewhere in the site ecosystem. Two pages that are similar will perform much worse than a single unique page. Ideally you should have one page for one keyword / search term / product. Things start to go wrong when you create multiple pages that advertise the same product/s. EasyJet ranked well on specific flight searches but suddenly created many weak pages (clustering) which resulted in overall loss of rankings. Argos were ranking well (#2) for “iPod price” but suddenly dropped – they created 4 similar pages on the site, none of the pages were connected. shop.tescomobile.com was ranking very well for searches on PAYG mobiles. Rankings lost when www.tescomobile.com created similar landing pages. Natwest Bank also created a personal. sub domain and this resulted in big drops for main search terms. 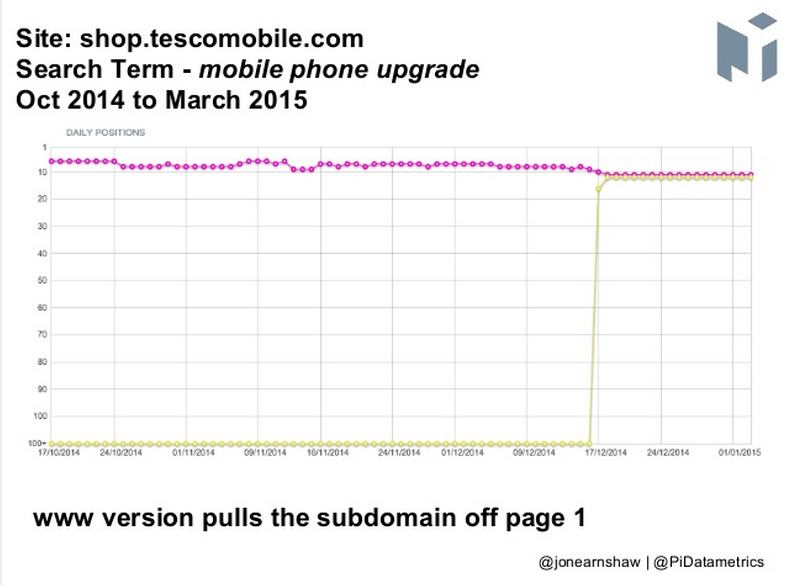 The graphic above shows how the search term “mobile phone upgrade” dropped out from page one of Google for Tesco (shop.tescomobile.com), The drop coincided with www.tescomobile.com creating a page that was optimised to sell the same produce. The overall result is that Tesco went from the top of page one for a big money keyword to effectively nowhere – they killed their own results! It really is a case of less is more when it comes to content optimisation! Jon said that he has seen cases where the second page is ranked between 150 and 200 in Google, but this is still enough to pull the main page out of the top results. Some websites try to increase their global exposure by creating new international domains, but poor content management results in cannibalisation and a loss in search volume. The main example discussed was Hotelscombined.co.uk and Hotelscombined.com, which have recently started to compete with each other – the result is Hotelscombined.co.uk lost Google search traffic. What was interesting in Jon’s talk is that often the examples he gave were ones he discovered – the websites are still (or at least, were not aware) that there was a problem. This in itself provides an indication of how much number crunching he is doing. To avoid these problems, all departments must talk to each other about web content across a business. Regardless of a small website or a major ecommerce business, changes to pages and additions can affect rankings in unexpected ways. Jon talked about “subtle flux” – Analytics often indicates when a problem is about to strike. At around the time that the new, duplicate content is created, there is a slight flux in the SERPs – not a major drop, just a wobble. But a few weeks later the big drop comes. Rob talked about advanced competitive intelligence – determining what searches are the most VALUABLE. This talk was a bit technical, in that it requires a lot of number crunching and analysis. The over message though was simple – you can still do well in Google if you know how to find less competitive keywords that still provide a good return on investment. Keywords used in search signal user intent. Rob discussed his search ranking score system that he uses to allow him to “win with less” by targeting less competitive but more valuable search terms. Rob’s main example was how Argos is beating Amazon in search by focussing on screen size searches for televisions. Amazon controls brand searches, and to some extent type of screen (HD, LCD, etc.) but Argos is winning on searches for screens of a particular size – and this is how people in the UK are shopping for their new televisions. Always rank your best UX – know what your users / customers want and rank for it. Don’t just follow the major trends that are already saturated. Rob talked about how leveraging news can help boost search results. Create pages for specific events throughout the year and link to relevant products. Think ahead – plan a calendar, so that you have your Christmas, Mothers Day, New Year, May Bank Holiday, Burns Night etc. content in place all the time. Good use of question / answer pages on your site can bring in a lot of traffic – people still search by asking Google a question – give Google (and your customer) the answer! This was the second time I have seen Dave Naylor speak. Both talks were excellent. I would love to see Dave in the same room as the “disavow all back links” brigade that currently plague the Google webmaster forums – he has a very different opinion on link building! However, today he talked mostly about …. Dave talked about the future of search and this focussed on mobile. He raised an interesting question based on his own experience with Google WMT notifications and the mobile update. His own website is labelled as “mobile friendly” in Google search results at the moment but he received a WMT message saying that he had mobile issues that needed dealing with. Google’s mobile testing tool highlighted problems. So people who currently have the “mobile friendly” label need to still check their sites – Dave believe that the mobile update on 21st April will totally overhaul these messages and frankly, anything could happen. Dave believes that the mobile changes in April will give a boost to websites that have apps – if a person is searching for a topic on mobile and they have an app installed that provides an answer, Google may highlight this in the SERPs. This makes sense for Google who want to provide searchers with the best results for them at any given time – having an app may mean that the content does not need to be downloaded – it might already be there on your phone. It seems that Google recognises that a good app can provide a better user experience (UX) than a website – they provide more information, a faster / instant connection to the content and are not reliant on constant Internet connection. Plus, apps are an indicator of TRUST. People tend not to order from new sites on their mobiles – they search on mobile and then go to a desktop to make the purchase. Suggestion: Websites that provide an easy mobile buying interface may start to perform better. Store user data and accept mobile payments. The idea that we should build sites for users and not Google is rubbish. “Sod humans, it’s Google that needs help!” – Dave Naylor. We, SEOs, need to help Google find the best sites by improving on-site SEO and pointing more links then! Samuel Scott : Stop Thinking About Links. Start Thinking About Publicity! Many people blog about Brighton, including some of the speakers. I might add more resources as I find them. ← Microsoft Cloud Round-up: What Can It Offer Your Business?